I know that it is completely unconfirmed if there will be any waterpark expansion in the future or not, but I can't resist to share my thoughts about such an expansion! I was a big fan of the Soaked expansion in RCT3 and spent most of my hours creating indoor waterparks or waterparks situated on islands, etc. So if any of you folks here enjoyed Soaked as much as I did, please share your suggestions about how such an expansion could be made a lot better than in RCT3. My first suggestion would be advanced waterslide options. What I mean by that is best described in this photo, a multiple bowl slide. 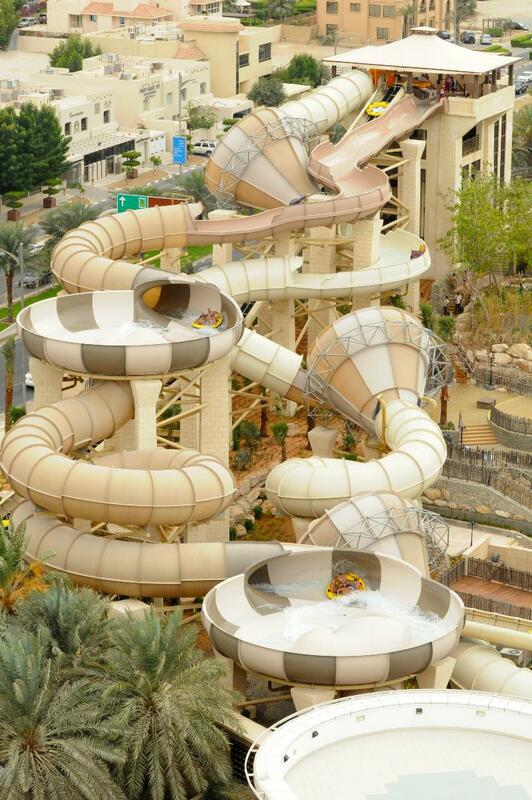 This would greatly increase the fun and possibilities for waterslide builders and enthusiasts. Remember that such an expansion is completely uncomfirmed and this thread is just for fun. I would like to hear from people who enjoyed building waterslides and pools as much as I did: What would you like to become reality if such an expansion was ever made? Feel free to share your ideas! Children's play areas in the pools would be cool. Vertical drop waterside too! Vertical drop slides would indeed be a very much appreciated feature! Besides, having prebuilt towers from which you can start the slides would be great. Would make for some truly awesome parks. Yes, the towers would make it so much easier to build groups of slides. Probably cheaper in construction too! all of those should be in the game even if its a water expansion pack. I whole-heartedly approve of such an expansion. Loved it back with RCT3 but this time it'd be even better since they'd have the improved "track building". We could finally see realistic replicas of some of our favorite slides and attractions! The ability to build pools directly into rocks! Maybe even offer a prebuilt hall for indoor waterparks like this one. Would save a lot of time to have some prebuilt halls with different scenery types (pirate, beach, etc.) I remember spending most hours actually creating the walls in RCT3 rather than the waterpark itself. As an expansion where they go whole hog, yes definitely. If it's done right, I'd be up for paying for it. I see that Frontier is very focused on the styles and content, so I have absolute faith that if they do it, it'll be done properly and It'll go beyond what we're expecting. This YES! But for expansion. Not now. Better with quality theme park game than cram in everything you can and only a few of every thing. Did not know about the light show slides, how fun!